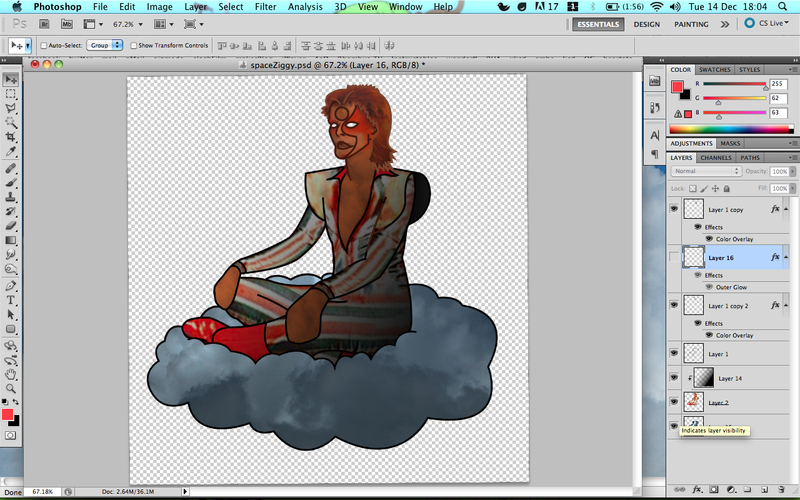 Right, so I need to draw and texture seven different evil david bowies. What have I gotten myself into? 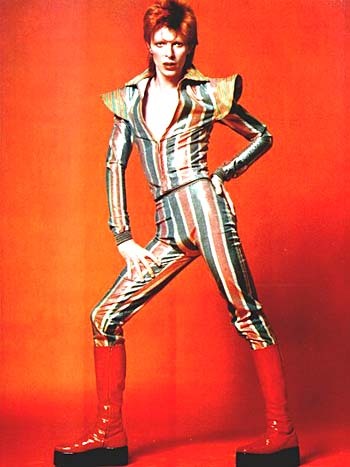 But the first one, the one that I need for my prototype, is Ziggy Stardust. 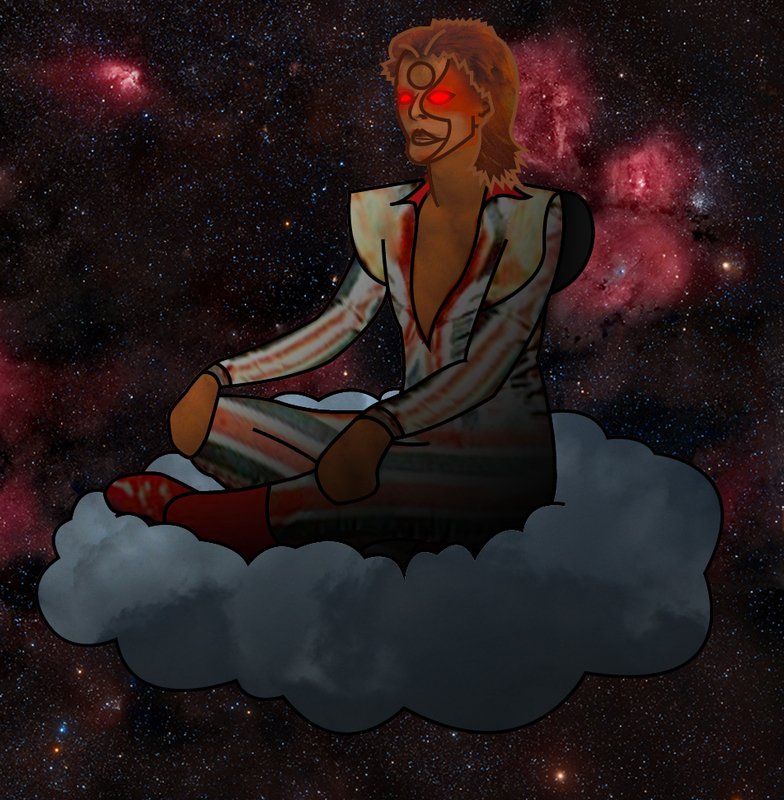 David Bowie lends himself nicely to this project since he is in himself, rediculous. The clothes he wears alone fit the bill nicely. Also, how could I resist? I started off with a fairly poor sketch. I havn’t done life drawing in such a long time, getting him to look right was a real struggle. It’s okay for a basic sketch that I can build upon, but needs a lot of work before it’s finished. I next took this into Illustrator and did the line work for the piece. 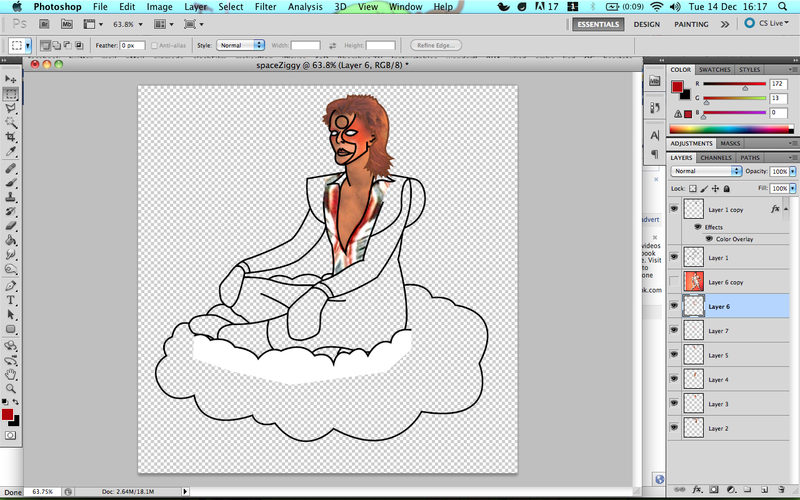 By doing it in illustrator, I can trace over both the sketch and the reference photo to get everything spot on. Notice that the hand is off, I do fix this later. I didn’t spot this at first, only later on after I had textured everything. Big pain in the arse to fix things then. Next I take the line drawing over to photoshop and add in some textures. 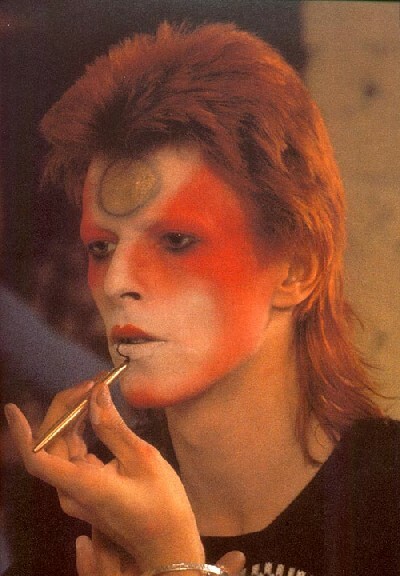 I started with the face and morphed the david bowie lip paint photo I shown you above, to fill my line drawing. I get nice natural looking textures like this instead of using other sources. 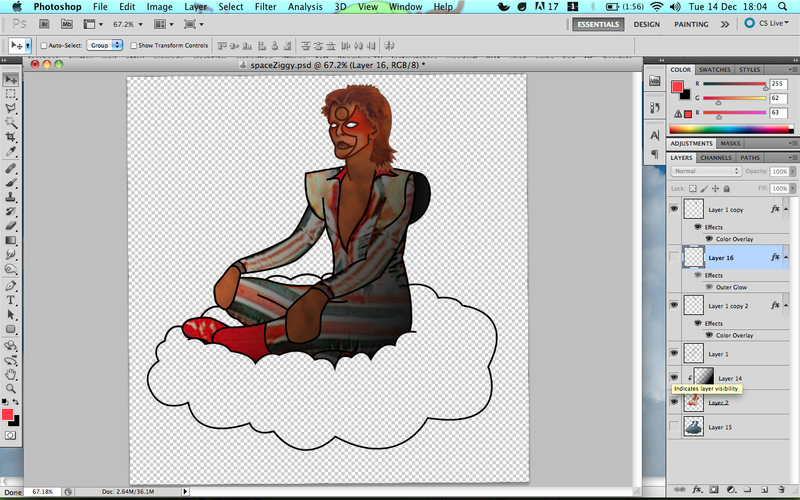 It makes the drawing fit my style rather than have an odd photo of david bowie shoved into my game. Ill be using this pose throughout and just dressing him differently so It should be fairly easy to do the others now that I have done this base. I next textured the rest of him. 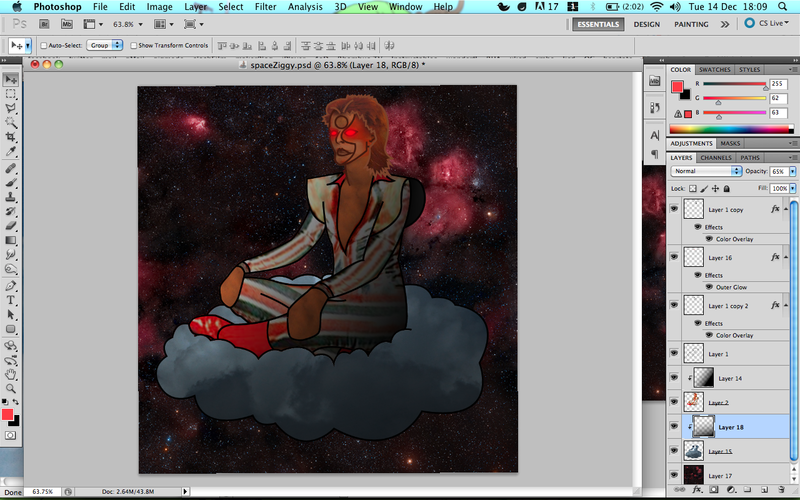 By using another david bowie image to get the texture for his clothes, I really capture his style. I next add some gradients to take the harshness off of the colour and hide some mistakes. 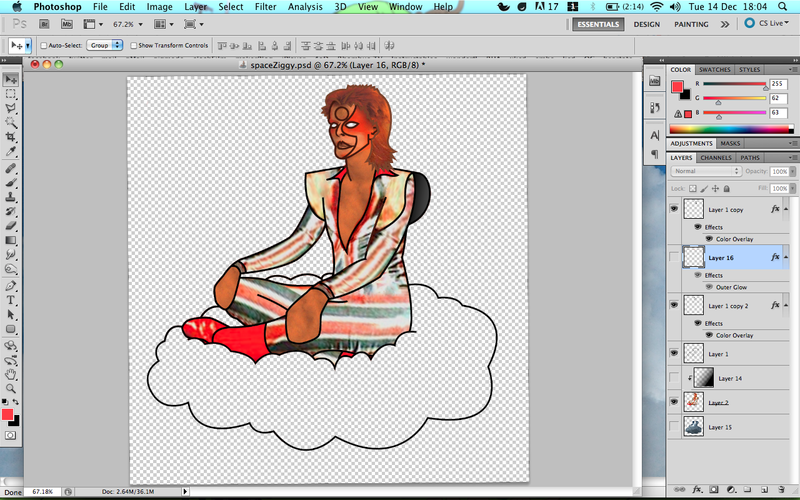 Now I add in the cloud. 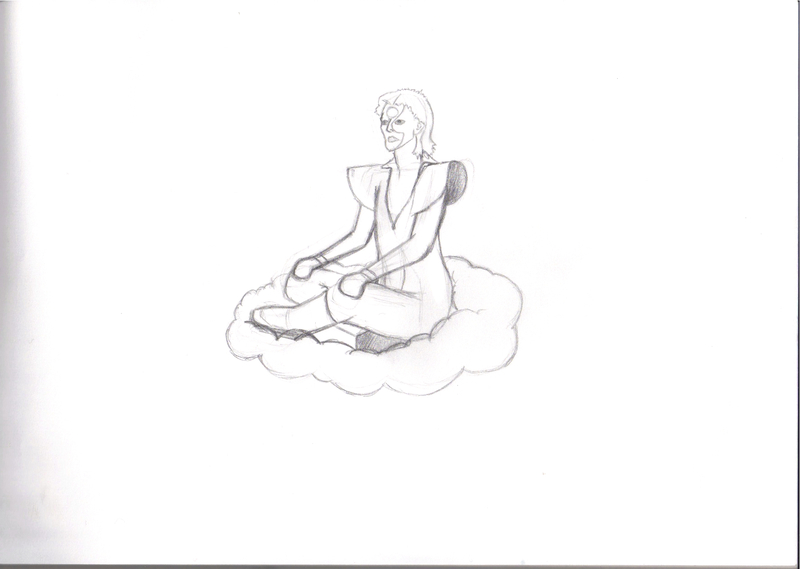 This is a simple cloud image that has been clipped to shape the cloud lines I drew. It is then colourised to look like a dark, evil storm cloud. Now all he needs is some glowing red eyes and a background. The eyes are just a simple colour fill with a glow layer mode. This is when I noticed the hand was off. I fixed this by redoing the hand lines in illustrator, copying that section back in and photoshoping the textures together where the were missing. Simple when using the patch tool. 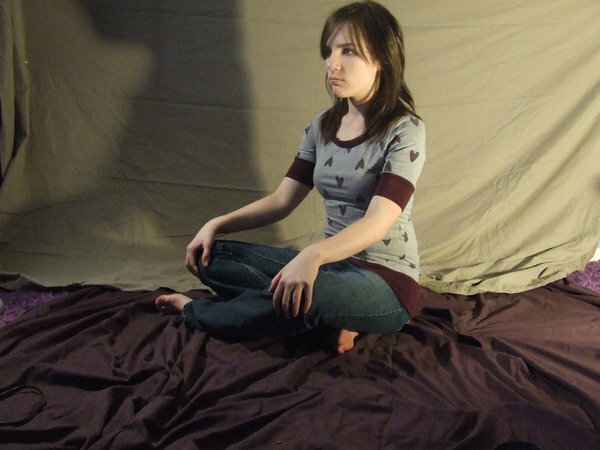 I also added another gradient to help the sitting effect look right. This is the process I use when I do any of my drawings. It’s an odd combination of vectors and photoshop. But I think it works well together and gives me an interesting effect. My method for the mind creatures is slightly different, but that is due to the fact they dont have textures. 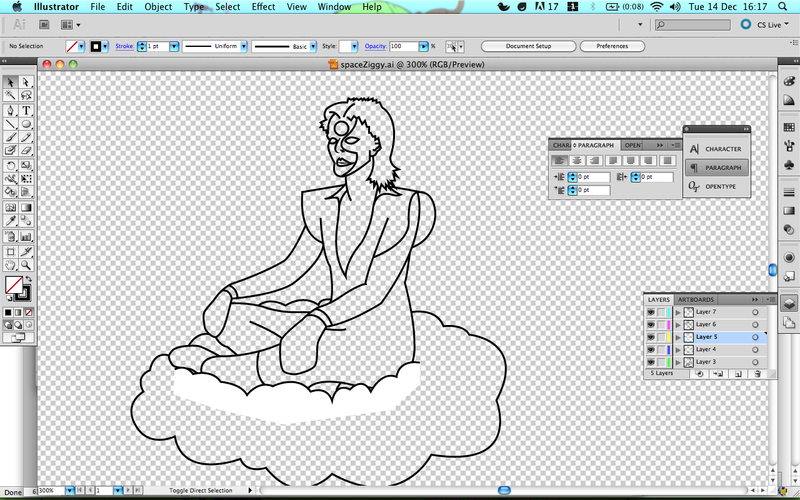 But this is exactly how I made the space giraffe and how I will be doing the other bowies.